« Sugar Tax? Yes, please. This entry was posted on January 31, 2019 at 12:37 am and is filed under Gerard Oosterman. You can follow any responses to this entry through the RSS 2.0 feed. You can leave a response, or trackback from your own site. What is it with bolts in tyres ? I’ve had two in the last couple of months. I don’t remove them either but we have a convenient local type guy who fixes them in about 30 seconds with a nifty awl-like device. A smal rubber asp and a fair bit of pushing, pulling and grunting. $20 donation and we are back on the Riad again (cue Willy Nelson). Yes, I was surprised about the size of this bolt. It was a hexenal headed screw with a washer behind it. The sort they use on zinc roofs (rooves). Was it a revengeful act by our cyclamen thieving neighbour? But she is 87! Not likely, Trouserzoff. My spare was a space saving tyre. It was not to be driven on for long distances. It looked more like a motor cycle tyre. Anyway, the tyre was fixed and plugged where the bolt used to be. Glad you missed having a flat tyre. Enjoy the new bin. Yes, the bin is all new and shiny. I practice the pedal whenever I get bored or feel like some exercise. You are right, Robert. Agreeing to the new bin was not a big deal. In marriages it is give and take. Those little things can flare up during the heat. Even after almost 53 years, one still is circling around seeking positions to defend, in changing domestic issues. Yes, winter has the US in its icy embrace. I know it well having lived in Finland a long time ago. A lot of Finns & Norwegians settled in Wisconsin, (and some Dutch in Sheboygan county), but next-door, in Minnesota, every third person is descended from Scandinavians. I think they ordered this subzero weather, and it was delivered here by mistake. If we could just work out an exchange program with Australia – – a few cool breezes for you, and a bit of warm sunshine for us. I wasn’t aware so many Scandinavians went to the US. Robert. I know Helvi’s father lived in Canada for a while but came back to Finland, got married at 45 years and had nine children. I love Japanese food too and yours looks delicious. When is this dreadful heat going to end? A couple of nights ago, we had a rousing ( to say the least) thunderstorm which brought us 33mm of rain..so very welcome, but now we’re back to the hot weather again and it’s windy too. Yes, Jane. Today, a hot one again but this afternoon the temperature is supposed to drop to 19C. We can’t wait. The Bento today was a mini one. We both had a good breakfast. My iPhone died just after the one year warranty had died as well. So we drove to the Telstra phone shop at the shopping centre. I have just set up the new one and am so proud of having achieved that with the complications of transferring photos, passwords and codes texted to my new iPhone. iPhone and computer issues easily get loaded with marital tension but more at my end than Helvi’s. She is the sturdy straight sailor enjoying clear air and blowing breeze. The bolt in the tyre was “Karma”…..be warned, Gerard…women have strange powers and are in constant psychic communications with various Gods….In Italy, it is only the women who can reveal and remove the “Malocchio” ..and if you are not sufficiently ” generous” in your thankfullness, they can just as easy put it back on again as your foot steps outside their door! Be thankful Helvi didn’t ask for a steel spike to go through the tyre, because it would have been YOU outside in the heat waving the NRMA van down! I find it odd how a bolt can go through a tyre with the washer as well. I haven’t had that done ever. But Trouserzoff had two of those recently. What is going on here? The NRMA man was very friendly. Lean and fit. His wagon was impressive. Now there is a job that must give a lot of satisfaction. Relieving anxious car drivers and getting them back on the road again. Odd..yes…I wasn’t going to mention this next “incident” with my good lady…Not wanting to instigate any new Salem style or medieval witch hunt, But just tonight..as has happened numerous times before, I got a political “Robo Survey” over the land-line phone…I always hand the receiver over to Irene when these call come in…she revels in them, punching the numbers selected in with a robust strike of her finger..and I can state with eerie and suspicious premonition….you know..( lowers voice to a whisper) she ALWAYS gets them right!!….. I sure do appreciate good men, like you, Gerard…who are willing to bow and make their wives happy. 🙂 Thank you for being a good man! Please stay cool and safe! Cool HUGS to you and Helvi! Yes, Carolyn. A happy wife is what makes marriages stay together. I was trying to stick to the plastic bin but I could see it would ruin the day. Where would we be without a woman? In the garden of Eden eating an apple and that can get very boring. Glad you like my writing, thank you. You are so kind. I’m not that keen on Japanese food..especially those raw Sushi things…sure, they look pretty, all colour-coordinated with the dark seaweed wrappings and those fine lines of another vegetable matter giving a “sketched” look about them…But then you Dutch have a tradition with that other curious seafood dish..: “roll-mops”….another dish I try to avoid…and of course, we know of the deep-north denizens and their familiarity with various raw fish dishes…I don’t know…what’s wrong with a damn good lasagne? We both like fish, raw or cooked. We have salmon fillets twice a week and often the Bento sushi for lunch when we go to this large shopping mall. We love the Bento sushi. Thinly sliced raw tuna can be very nice, Jo. Especially mixed in a salad with lots of chopped garlic. We love lasagne and I make e very good pasta with deep fried chopped-up anchovies with rosemary. Towards the end I mix in some fresh crème and mustard. It makes me hungry right now thinking about it and it is only 9.45. Yes…Irene does this marinated, raw Tas’ Salmon slices along with a salad….it is delicious, but I do approach it with a degree of animal caution and cunning..(that I DO NOT let Irene see !).. Sorry, but if I were in the food court with you, I’d be munching on the chicken. Granted, I haven’t had KFC in several years, but if the choice were that or raw fish, I’m taking the chicken. I tried to develop a taste for other kinds of sushi, and succeeded to a degree, but seaweed’s not on my personal menu either. Now, a nice grilled salmon steak or mahi-mahi? That’s something different. I do love fish and seafood, as long as it’s cooked. As for the plastic vs. stainless, I’m agnostic: either would do. My biggest trash problem just now is an across-the-hall neighbor who refuses to abide by our trash rules. It’s going to be time to have another talk with management tomorrow. The details don’t matter; getting it resolved does. It is good you got home safely, and weren’t stranded out in that heat with a flat tire! Ceviche is something we had a long time ago, when a Peruvian born friend visited us. It is lovely and I should really make it one day. That heat came to a sudden end yesterday afternoon and this morning the temperature was 13C.At the moment it is just 16C so, back on the heating! Unbelievable. My love of raw fish established itself early. As a boy I used to ride my bike to Scheveningen which is the sea- port of The Hague. I loved watching the fishing boats come in. They were still using sails then. Sometimes fishermen would drown during terrible storms while away for long period fishing for herrings at the Doggers-Bank near England.. The wives would be waiting wearing dark-brown long billowing skirts at the end of the quay, hoping for their husbands to be safe and well. I used to come home with fresh salted herrings. They were beautiful with some chopped up raw onion. As for plastic versus steel. As long as it looks aesthetic adhering to the rules of beauty is what both of us prefer. That plastic bin irritated Helvi more than me. It is more of a Finnish thing. Hmmm…. now it occurs to me that your love of the herrings and anchovies could be a ‘finnish’ thing, too! Well, glad to know that outing had a happy ending. Ah, the wisdom of the long-married! I am sorry you are dealing with this awful heatwave. I heard the cause of it as it relates to the polar vortex that’s causing all the trouble in central and eastern America. But I also heard that it has been SO hot in Australia that even horses had to be euthanized. Heartbreaking. I’m glad you and Helvi have air conditioning. The alternative is not good. All very well till the pedal mechanism gives up. 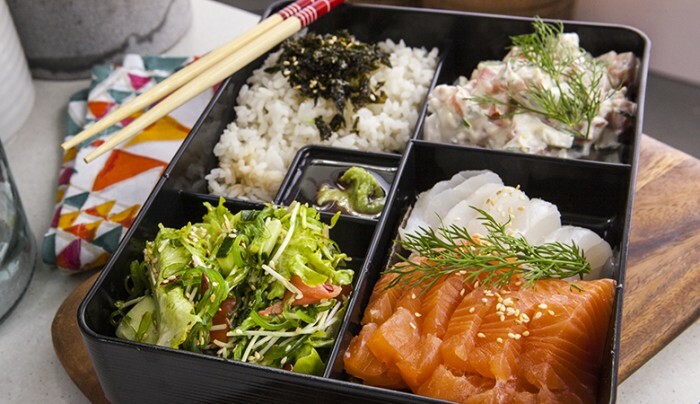 The Bento box looks delicious.